Western N. America - British Columbia to Indiana, south to Texas and California. 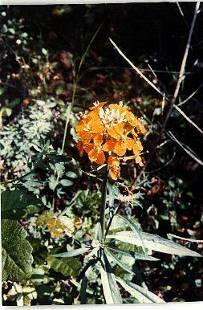 Found in many habitats from southern British Columbia to California at 750 - 3600 metres. Open dry flats and hillsides, from the lowest valleys to about 3,000 metres in the mountains. Olympic peninsula and Eastern Washington. Cheiranthus angustatus, Cheiranthus asper Cheirinia aspera, E. amoenum, E. angustatum, E. arkansanum, E. asperum var. amoenum, E. asperum var. angustatum, E. asperum var. arkansanum, E. asperum var. capitatum, E. capitatum ssp. Angustatum, E. capitatum var. amoenum, E. capitatum var. angustatum, E. capitatum var. capitatum, E. capitatum var. stellatum, E. capitatum var. washoense, E. elatum, E. moniliforme, E. nivale, E. wheeleri. Grow seeds outdoor or take cuttings in midspring. Germination usually takes place within 3 weeks. Poor germination after one year of storage. Short shelf life. Seed - sow spring in an outdoor seedbed. Plant the seedlings into their permanent positions when they are large enough to handle. If seed is in short supply, it can be sown in spring in pots in a cold frame. When they are large enough to handle, prick the seedlings out into individual pots and plant them out in early summer. The plant prefers light (sandy), medium (loamy) and heavy (clay) soils, requires well-drained soil and can grow in nutritionally poor soil. The plant prefers neutral and basic (alkaline) soils. It cannot grow in the shade. It requires dry or moist soil. Container plants grown from seed or cutting in midspring. Requires a well-drained soil and a sunny position. Deadhead regularly and mulch in autumn. Grows to 1 foot a year and then dies back until next year.